Obituary - Audrey Brooks - Bentz Funeral Service, Inc.
Those wishing to express an act of kindness in Audrey's memory may make a donation to either the Juvenile Diabetes Research Foundation or The American Heart Association. 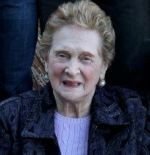 Audrey Brooks passed away peacefully on Saturday, March 9, 2019 in hospice care at the age of 90. She is survived by her daughters, Phyllis and Wilma Brooks, son-in-law Michael Stoller and her granddaughter, Brooke Stoller. She was preceded in death by her husband, Irving Brooks. Audrey was born in Glens Falls, NY on August 5, 1928. She graduated from the University of Wisconsin and after a few years in NYC she moved back to upstate New York where she met her beloved husband. She was an elementary school teacher in the Utica, NY school system for over 30 years. She was a devoted teacher who loved her students. She moved to the Boston area in her later years to be close to family and recently resided at The Traditions of Dedham. Audrey will be remembered for her love of bridge, good food and family. We will miss her strength, feistiness, and witty sense of humor. Her funeral will be Tuesday, March 12 at 10:30 am at Bentz Funeral Service, Inc., 13 Oxford Road, New Hartford, NY, with Cantor Kalman Socolof officiating. Respects to the family can be paid there an hour earlier at 9:30 am. Interment will be in Temple Beth El Cemetery in Whitesboro, NY. Those wishing to express an act of kindness in Audrey's memory may make a donation to either the Juvenile Diabetes Research Foundation or The American Heart Association.